The description of the man from two grounds workers at the nearby residence of the Australian ambassador appears to match 37-year-old Daron Wint, who's been charged with first-degree murder in the killings and whose trial at D.C. Superior Court is now in its second week. 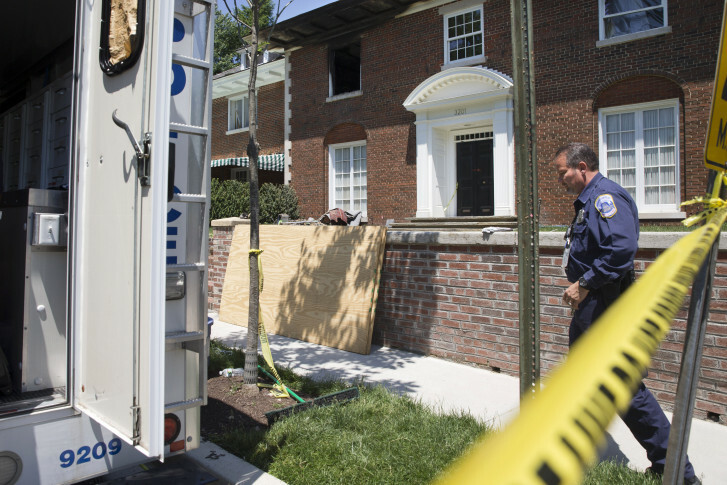 WASHINGTON — On the day a mansion in D.C. went up in flames in May 2015 and the bodies of three members of a family and their housekeeper were discovered inside, neighbors said they saw a man with dreadlocks approach the house’s attached garage and duck inside. The description of the man came from two employees at the nearby residence of the Australian ambassador, and it appears to match 37-year-old Daron Wint, who’s been charged with first-degree murder in the killings and whose trial at D.C. Superior Court is now in its second week. The sighting of the man came just an hour and half before firefighters raced to the burning house and found the bodies of 46-year-old Savvas Savopoulos; his wife, 47-year-old Amy; and the couple’s 10-year-old son, Philip, inside. The family’s housekeeper, 57-year-old Vera Figueroa, was taken to the hospital in critical condition and died a short while later. Prosecutors said Wint, a former employee at Savvas Savopoulos’ ironworks company, took the family hostage for $40,000 in ransom, then beat and stabbed them to death and set the house on fire. Wint’s attorneys contend it was actually Wint’s two younger brothers who planned and carried out the crimes. Marc Stephen Geaghan, who worked as a landscaper at the ambassador’s residence, told jurors Tuesday they saw the man walking down the sidewalk near the house at Woodland Drive and 32nd Street in the Woodley Park section. Geaghan said the man walked directly to the right-side door of the two-car garage. It raised about halfway open, and the man slipped inside. Andrew Tierney, who worked as the residence manager, was chatting with Geaghan shortly after noon when they both saw the man approach the house, Tierney testified. He said he remembered finding the visitor strange and even made a comment about it being “unusual” to Geaghan at the time. Tierney testified the man walked to the garage door without hesitation. “There was real purpose to it,” he said. He seemed to know which door to approach, he said. Tierney said he couldn’t say whether someone inside opened the door or whether the man had a garage-door opener. Both workers described the man as about 5 feet, 5 inches to 5 feet, 7 inches tall and dark-complexioned with shoulder-length dreadlocks. He appeared to have a drawstring bag on his back, they said. Wint was identified as a suspect in the killings several days after the fire, and D.C. police blanketed news media with photos of the Lanham resident. Police have said a blue Porsche that belonged to Savvas Savopoulos was driven away from the house and was later found on fire in Prince George’s County. Neither of the two workers said they saw the man leave the house, and they said they couldn’t remember whether they saw the blue Porsche that day. Also testifying Tuesday was a wallpaper installer who was doing work in the neighborhood on the day of the fire. Donald Spence told the jury he was driving down Woodland Drive on May 14, 2015, when he saw what he described as a “steamy white curve” of smoke coming from the second level of the Savopoulos house. At that point, the smoke was “just a thin veil — like eyelashes curling up,” he said. He went to the front door to the ring the bell and knock on the door, he told jurors. He said he could hear dogs barking inside and heard an alarm going off. “I don’t think anyone is in the house,” he told the 911 dispatcher. The fire department arrived in a few minutes. He testified he never saw anyone in the area of the house while he was there. Prosecutors have said three members of the Savopoulos family and their family were held hostage in the house for about 18 hours, starting at some point on May 13. From the beginning of the investigation, D.C. police have said it would have taken more than one person to carry off the elaborate crime. However, Wint is the only person who has ever been charged in the killings. Earlier Tuesday, Savvas Savopoulos’ assistant, 31-year-old Jordan Wallace, testified that his boss asked him to drop off the $40,000 in cash in the front seat of a sports car inside the house’s garage earlier in the morning on May 14. Wint’s attorneys sought to poke holes in Wallace’s testimony — including instances in which he appeared to lie to investigators when he was first questioned. But prosecutors have said they do not believe Wallace had any involvement in the crimes.